Start 2019 off immersed in the imagination! ​A.P.E. @ HAWLEY, in collaboration with SCDT, is proud to be bringing back this historic January movement series. 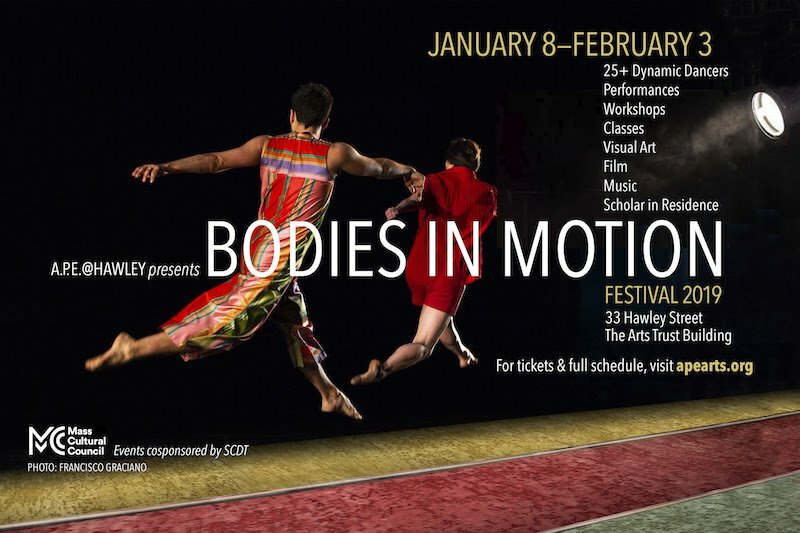 The Bodies In Motion Festival is modeled after A.P.E.’s 15 year movement series at Thornes Market, 3rd Floor. As a series of weekend workshops and performances this year’s festival focuses on diverse approaches to dance as a performative art: Improvisation, contemporary performance, hip hop and Butoh, and new works for the festival finale. Taught by local, national, and internationally acclaimed performance artists, these workshops provide students with the unique opportunity to engage with highly regarded and innovative artists in the field of dance today.